drama* on the waterfront: Clybourne Park: Who is Bruce Norris? Who is Bruce Norris - the man whose latest play, Clybourne Park, has won nearly every honour the theatre has to give? Here are three fascinating profiles – from London, Australia and San Francisco – that give excellent insights into what makes Norris tick. "The man behind the Pulitzer Prize-winning play Clybourne Park has built his career around watching middle-class theatre-goers squirm … as his plays send their deeply-held liberal mores up in smoke. 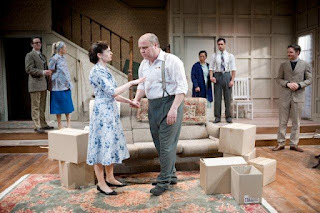 … During the second half of Clybourne Park gasps and nervous laughter erupted around the two London theatres in which it was performed as the multiracial group of characters competed to tell the most racist jokes they could think of. The most toe-curling of these involved a comparison between white women and tampons; I will leave the punch-line to readers’ imaginations. As an audience member (I saw the play twice), it was impossible to tell whether it was OK to laugh at jokes that would be derided as beyond the pale outside the auditorium – and it is this sense of unease that Norris delights in." To read more (and see the UK video of what audiences thought) click here. Clybourne Park, Circa Theatre, 2012. 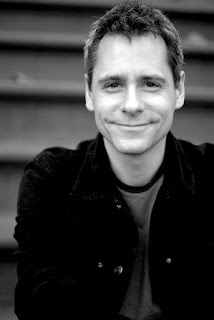 Photo by Stephen A'Court. "Bruce Norris has no need for surveys or focus groups: the American playwright knows his audience. The people who go to theatres, he says, are just like him: white, middle-class, educated, small-L liberal, progressive. But Norris - winner of this year's Pulitzer prize for drama for his play Clybourne Park - isn't interested in pandering to boulevard tastes. Clybourne Park, is satire of the sharpest sort, as he parodies the language, and the attitudes inherent in it, that white people use in conversation with black people." "Bruce Norris and journalists have a prickly relationship. In interviews, he can be curt, frank and painfully direct. A few writers he's rubbed the wrong way have been less than flattering in print, which is probably why Norris, when he agrees to be interviewed about American Conservatory Theater's production of his Clybourne Park, requests that it be via e-mail. From his home in Brooklyn Heights, N.Y., Norris politely answered e-mail questions. Q:You gave a fantastic performance in the 1999 production of David Hirson's "Wrong Mountain" at ACT. How have your experiences as an actor informed your work as a playwright? A: I suppose I'd say that I approach writing from an actor's point of view - basically, for me, writing plays is just an elaborate form of improvisation in which I act out all of the characters in my head and simultaneously transcribe what they say. Q:Someone with your writing skills could have gone in any number of directions - why theater, where the pay isn't exactly lucrative? A: I guess because in theater there's the understanding that the writer's word is final, as opposed to film or novels or even TV, say, where all sorts of forces conspire to undo the work of the writer ..."
Clybourne Park is on at Circa Theatre until 6 October. To book, please call the Circa Box Office on 801-7992 or go online www.circa.co.nz.